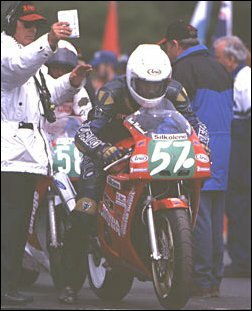 You would be forgiven for not knowing who won last years 400cc Lightweight TT after the controversy involving Geoff McMullan. 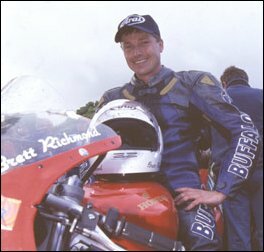 The forgotten man is Kiwi Brett Richmond, who on only his third visit to the Island won the race, but was denied the honour of climbing the top step of the rostrum. We spoke to Brett about the incidents last year, and his plans for this year. Brett, I would like to start by asking you about last year first. You won the 400 Lightweight Race after much controversy. Before we talk about the troubles, you must have been delighted to win a TT even after what happened? It's always been a dream of mine to win a TT title and I did it within three years at the Isle, which is a couple of years earlier than I had planned. After the race I thought that there was no way I would even be on the podium because my bike only ran on three cylinders during the race which we later discovered was due to a crank bearing problem. As we all know, you missed out on the opportunity to stand on the top step of the rostrum. This must have been very disappointing for you? Looking back at it, being told that I came second was more of a buzz than the anti-climax of winning 2 days after the race. Yeah I would have loved to be able to represent New Zealand on the rostrum especially as this was the third time in a row a New Zealander had won this class but it wasn't to be, and you just have to get on with it. What are your opinions on what went on after the race regarding Geoff McMullan? Geoff seemed very, very happy with winning which does make me wonder if he knew the bike was illegal. I mean if it was me, I wouldn't feel too good about myself obviously and I doubt whether I would have shown the emotions he did. Were you happy with the way the situation was dealt with by the officials regarding both McMullan and yourself? Yes I was. My team manager, John Shand handled everything and I was informed on a regular basis as to what was going on. From what I know the officials followed the rulebook and were more than fair to all parties involved. Moving on now, what plans do you have for this years TT? Because of the controversy after the 400 race, I was all but ignored by the media, which has resulted in me not yet securing rides for this year. Honda is cutting back on their budget so I am forced to look elsewhere. Are you interested in competing in the larger classes at the TT at any stage in the future? Most definitely. For this year I am hoping to race in the 400 Lightweight, Junior, Production, Formula 1 and Senior. I'll race anything! You are one of many New Zealanders competing at the TT. What is it that attracts so many of you over to the Island each year? The Isle of Man TT has always had a high profile in New Zealand particularly for me with kiwis like Graeme Crosby and the late Robert Holden doing very well there. It is the most famous Road Race in the world. 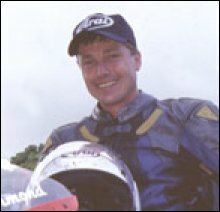 What are your views on the TT as an event, and the way it is organised? It's a lot of fun with tons of things for people to see and do and everyone is on the same buzz for motorcycles. I don't really have any complaints apart from the fact that they can't organize the weather! Are there any improvements you would like to see made at the TT? The only improvements I can think of would be the weather and making sure TT winners come back. Time is ticking away, and at the moment I am without any machinery after doing well last year. Changing the subject slightly, where else do you race during the year? I do a bit of racing in the UK and New Zealand but I was just having a laugh and the bikes were a laugh as well. The TT is what the year is based around really. And looking in to the future, what are your ambitions in the sport in particular regarding the TT? I want to race in the British Championship at some level and keep coming back to the TT while I'm still enjoying it. Thank you for taking the time to speak to me, and best of luck this year.